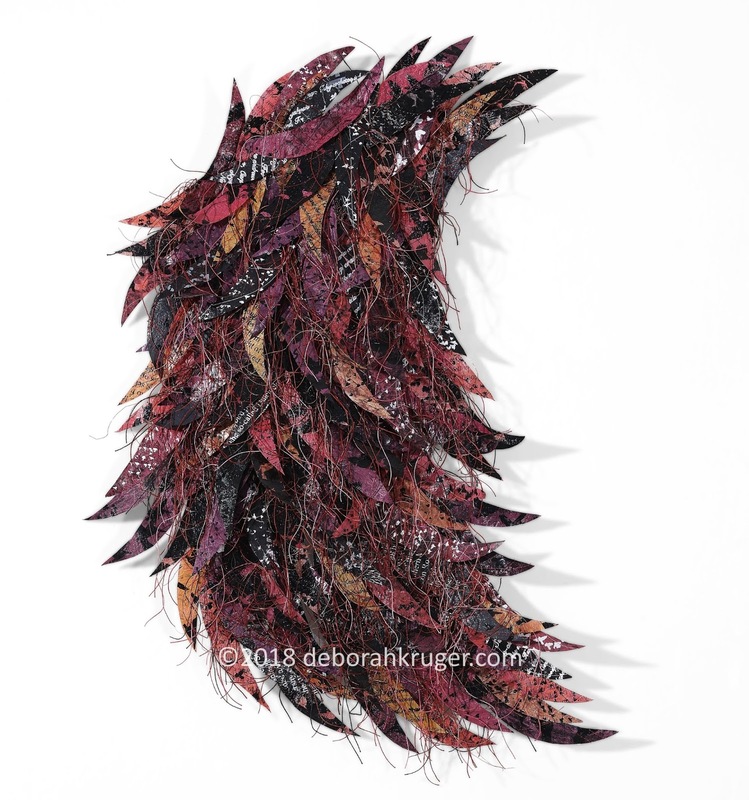 The artist Deborah Kruger uses her creativity to understand the world around her, specifically the natural world, its problems in trying to adapt to enforced changes by humans, and ultimately the shifts that are forced on ourselves through those changes. 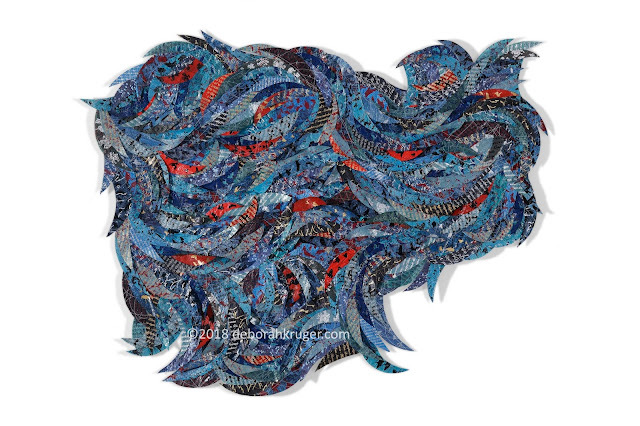 Her work is about movement, migration, change, uprooting. 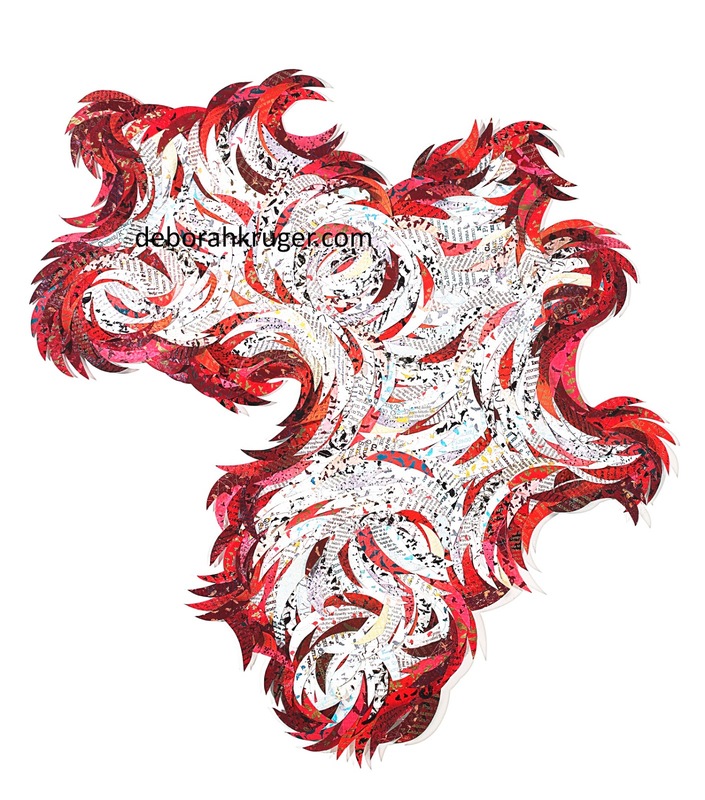 In the following interview Deborah helps explain her view of the world, her perspective, her creative understanding. Migration is a big part of the Plumage series. At first it seems that the theme is purely devoted to bird migration, but you have expanded the definition to mean so much more. What else does it include? DEK: Like most artists, I learn about the world through making art. 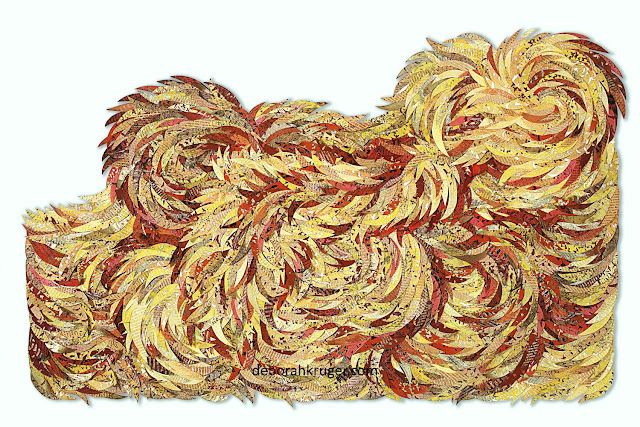 Initially, the work was purely about birds and their migration. Over time, I realized that the interruptions to bird migration due to habitat destruction were parallel to the migrations of humans, who are also forced to adapt to loss of homeland due to climate change and political and natural disasters. Now I see birds as a metaphor for all species whose natural patterns change due to circumstances outside of their control and must move in order to survive. The potential, and many would say, imminent collapse of the complex structure of life on this planet is an issue for a range of artists around the world and across disciplines. How do you personalise that concern in your work? DEK: Artists have the opportunity to use our visual voices to bear witness to the momentous changes that are happening ecologically and politically. Finding a way to express our despair, our thinking, and our hope in ways that are evocative rather than literal is the challenge for artists with conscience. For me, the most powerful art is a fusion of beauty and discourse. Why did you focus in on plastic bags specifically as a symbolic material to use in your work? 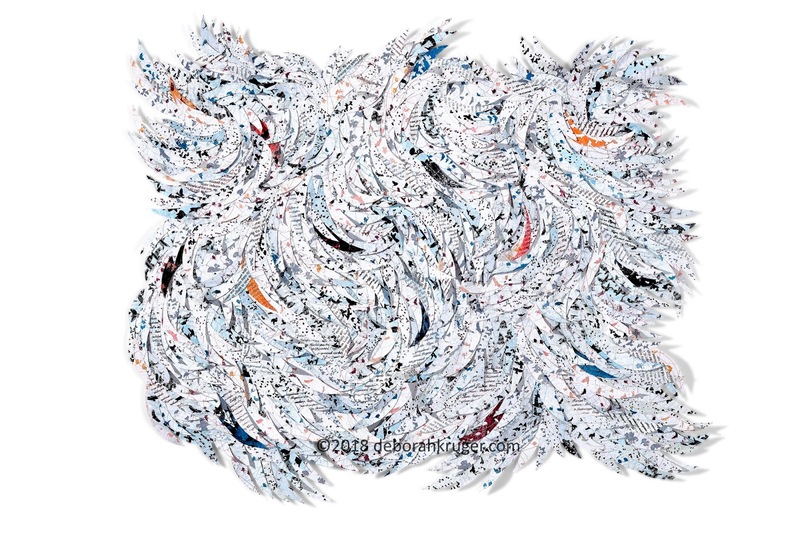 DEK: I chose plastic bags as my medium because they have a silent and insidious presence that negatively impacts birds and most other life forms. Our persistent consumption of plastic drives this industry. In choosing plastic as an art material, I am embedding a subliminal message in my work: consumerism is killing our birds and our planet. How important is contact with the natural environment in your daily life? DEK: Since I was a young child, I have always gravitated to nature. I grew up in a city but managed to find a boulder to climb on or wetlands to explore. As an adult, I have spent much of my life in the woods. Now I live on the largest lake in Mexico and spending time on her shores continues to feed and inspire me. The simple notion of the interconnectedness of all life on the planet seems ungraspable to so many humans. Why do you think that is? DEK: Indigenous cultures are closely tied to the land. Our industrialized/civilized society has lost that connection and therefore the understanding of how land is essential to life. Without sacred respect for land, we have no compunction about destroying it. The same holds true for birds and other vulnerable species. We need to re-integrate natural studies into our educational systems so that the next generation learns to find joy and wonder in nature rather than on a screen. 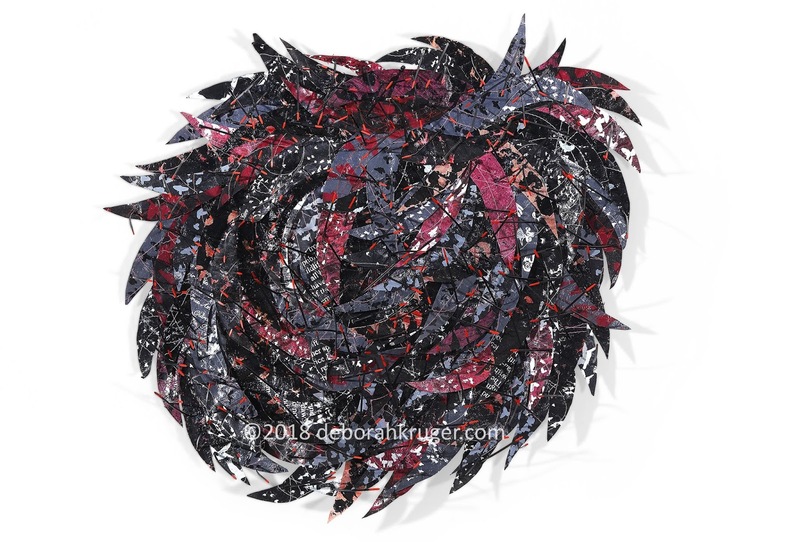 There seems a singularity and connectedness to your work, single feathers being integrated into a larger whole. Do you see singularly and connectedness as part of your message as an artist? DEK: Everything we are and everywhere we go is composed of invisible and constantly moving molecules. This awareness permeates all of my work, which is singular and connected because it mirrors our complex world. I want the feathers to be beautiful components within a larger piece that operates on many levels visually and intellectually. I want the movement of the feathers to echo the movement of migration. I want the images of endangered birds and endangered languages that are printed on the feathers to dawn on us, to trouble us and to inspire us. Channeling a viewer’s growing awareness into action would be deeply satisfying for me as an artist. With plastic fast clogging up the planet’s natural environmental cycle, wouldn’t it be more apt to use ‘disposable’ plastic in your work? Will you bring in any further man-made single-use materials to your work? DEK: Hopefully my artwork will not end up in a landfill. I like to think that by using plastic bags, I am diverting them from poisoning our environment. I worked with fabric for many years and know that even disposing textiles has become an environmental nightmare. There are many new technologies on the horizon being designed to address this disposal problem. Unless we do ephemeral art, artists have to address our personal footprint. Where do you think your creative work will go from here? DEK: I have just written a proposal to fund several new projects that will continue to use the bird imagery in new and inventive ways. On the drawing board is a neon installation with the names of endangered birds that are illuminated and then fade out. I am also planning a large-scale public sculpture shaped like a bird-cage and built from water-jet cut metal shapes of endangered birds. Do you have any upcoming events for 2018 that you would like to share? 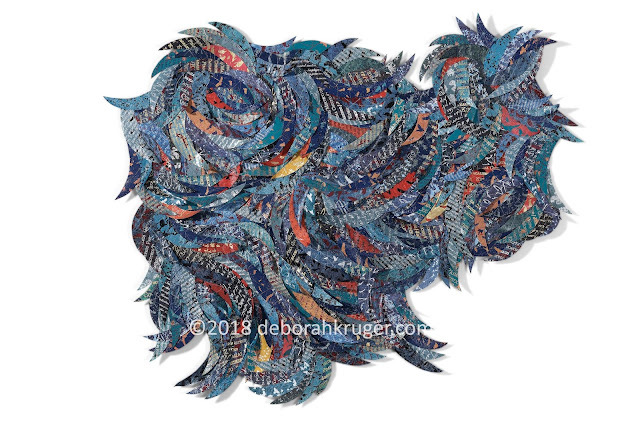 DEK: I will be debuting a new collection of the plastic-feathered pieces at a solo show titled Turbulence: Birds, Beauty, Language & Loss at the Chapala Cultural Center here in Mexico. The exhibition will run from August 4 – September 15, 2018. 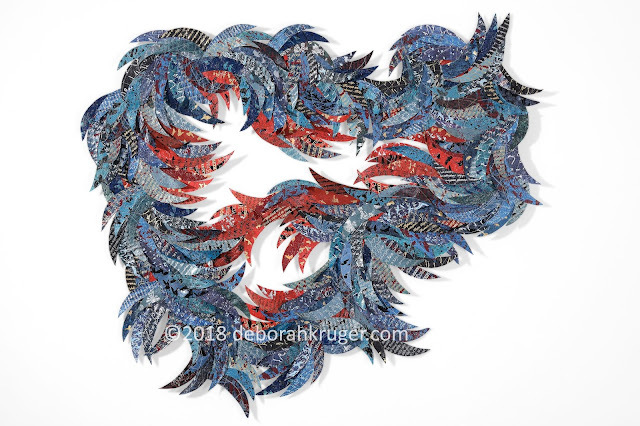 One of my new pieces titled “Harbinger” is based on the map of Cambodia because it is the last habitat for the 400 remaining Bengal Floricans. This piece will be included in the Climate show curated by Laura Kruger (no relation) for the Hebrew Union College Museum in New York City on view from September 6, 2018 – June 30, 2019.